Oliver Stone’s 2004 film Alexander portrayed the great Macedonian king as bisexual. Was he also a transvestite? Tony Spawforth looks to uncover the truth. This startling claim was made by a contemporary Greek, Ephippus, in his lost pamphlet depicting Alexander’s court in the last two years of the reign (324-323 BC). In a surviving fragment Ephippus alleges that the king liked to cross-dress as Artemis, the Greek archer-goddess of the hunt. Supposedly Alexander often appeared in her guise ‘on his chariot, dressed in the Persian garb, just showing above his shoulders the bow and the hunting-spear’. Chariot and bow were stock attributes of Artemis in Greek art but she did not wear ‘Persian garb’. Remarkably, Alexander did. Xenophobic Greeks routinely derided Persian costume as womanly. A sardonic Ephippus was put in mind of the Greek iconography of Artemis when he saw Alexander in his Persian robes going out to hunt on a chariot and armed with a bow. The passage that resulted is a libel. Most Greeks would have seen a king who impersonated the gods in this way as an arrogant autocrat inviting divine retribution. Ephippus was no fan of the world-conqueror, whose father Philip had destroyed his home city of Olynthus in 348 BC. Indeed, despite the nationalist fervor which Alexander’s memory inspires in today’s Greece, many ancient Greeks were deeply hostile to both Macedonian monarchs. But there remains a tantalising question. What was Alexander doing on a chariot, hunting with a bow while dressed as a Persian? Neither the chariot nor the bow was a ‘national’ Macedonian arm. In fact the Greek writer Plutarch records that Alexander used to occupy himself while on the march in Asia by learning chariotry and archery. A seal-stone now in the British Museum provides a clue. A Persian work of the fifth or fourth century BC, this masterpiece of miniature art depicts Darius I of Persia (522-486 bc) hunting from a chariot, which his driver steers while the king fires arrows into a rearing lion – one of the Asian variety, now all but extinct. Famous reliefs from Nineveh, also in the British Museum, depict the lion hunt of the Assyrian king Ashurbanipal (668-627 BC). He too hunts from a chariot with a bow and arrows. An enthusiastic audience watches from a safe distance. The lions are released from pens. The ground has been cleared like an arena. This is a carefully staged royal spectacular in which the ruler displays his manly prowess and symbolically overcomes his most dangerous enemies. In the Middle East the royal lion hunt descended from one ancient empire to the next as an unbroken cultural heritage. As the new king of Asia, Alexander seems to have made a conscious decision to associate himself with this tradition. The hidden nugget of Ephippus, as reinterpreted here, dates this remarkable development to 324-323 BC, years which Alexander spent touring the old Assyrian and Persian heartlands in what is now Iraq and western Iran. The evidence of Plutarch belongs to this same period. It comes from the so-called Royal Diaries, composed by a court insider to record the daily routines of Alexander at the end of his reign. What exactly was Alexander hoping to achieve? He had twice captured in battle the chariot, bow and arrows of the ill-starred Darius III, the last Persian king. Surely it was this paraphernalia that Alexander now displayed to his Asian subjects as spoils of war. Manipulating the age-old Middle Eastern ritual of the royal lion hunt, was he bent on reminding the local population who was now boss? His appearance in Persian apparel suggests something else. Alexander had first assumed a customised version of the royal costume of the Persian kings in 330 BC. More than two millennia before Elizabeth II wore a tactful shamrock green on her historic state visit to Dublin, Alexander was deploying royal clothing as a weapon in the battle for hostile hearts and minds. Alexander’s adoption of the traditional hunting style of Middle Eastern rulers in the last years of his reign is best seen as a dramatic further step in his attempt to identify himself with local customs. It also helped him to build bridges with one key group in particular, the Asian elites, with whom Alexander would go hunting. 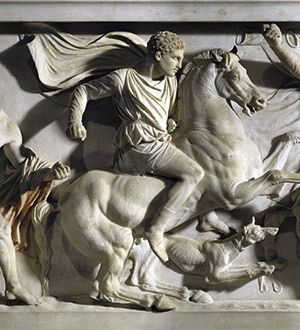 This aspect of the royal hunt is splendidly evoked by the so-called Alexander Sarcophagus, now in Istanbul but originally from ancient Sidon in today’s Lebanon. Dating from the late fourth century BC, its carvings show a young Greek king hunting lion alongside a companion in Persian dress; no doubt the local worthy for whom the sarcophagus was made. Traditionally and surely correctly these two hunters are identified as Alexander and Abdalonymus, a Phoenician princeling, whom Alexander installed as puppet king of Sidon in 331 BC. Then the two went hunting. Sport is a great unifier. Historically the royal hunt has often brought together imperial centre and subject periphery. David Cannadine’s Ornamentalism (2001), a book about the ideology of British imperialism, offers an eerie parallel to the Alexander Sarcophagus: the cover image depicts Lord Curzon, Viceroy of India, and the Maharajah of Gwalior posing for the camera as fellow huntsmen, each with a foot on a dead tiger. The disinterment of a new grain of truth from a malign Greek writer on Alexander makes two points. We are forcefully reminded that Alexander (a Macedonian) did not share the Greek disdain for ‘barbarians’ and their customs. He had a bicultural vision of how to rule his Asiatic subjects, which would probably have produced political dividends had he lived longer. Secondly, our knowledge of Alexander ultimately derives from a first generation of (lost) Greek writers, including hostile witnesses such as Ephippus, intent on a ‘controlled misreading’ of the historical Alexander. We are bound to wonder: how much else did they deliberately distort?